Peter Singer says we are all equally valuable and I believe him. This means I should do more, that the care of one small bundle (never mind that it is my bundle) is insufficient—even if this is what I am fitted to do. Across the road two magnolias, one pink, one white. In the days since we came home I've watched their stark flower-spiked branches soften and go pastoral—the green leaves of ordinary time climbing out of the wood. The thing is, there isn't any indefinite 'later': childhood, adolescence, adulthood. Then, God willing, I'll be wearing out. Already as I lay this down I see you as the reader. I think: A decorative mind isn't much of an inheritance; and One day there'll be no book of mine left on the earth. Having started as a poet I suppose any contribution is a positive mark on the ledger. —'Ordinary Time' Frank, intimate and compassionate, Anna Livesey's third poetry collection is alive to the joy and trouble of the world. 'Anna Livesey's Ordinary Time wonderfully gets the warm, heated, swaddled feeling of early parenthood. In these poems there's closeness, damp, suspension in a state of intensity and the thingishness of life. Livesey is great on the anchorage of parenthood, homes as vessels for living in, mothers as vessels for living in and close to, for moving away from. All is urgent, present and fiercely intimate.' – Jenny Bornholdt. 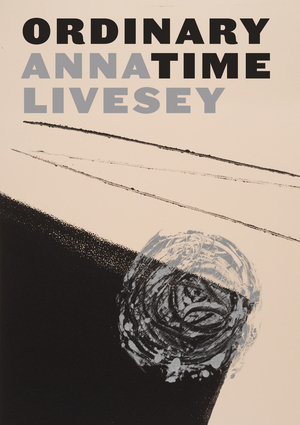 Anna Livesey is the author of two previous collections, Good Luck (2003) and The Moonmen (2010). She was the 2003 Schaeffer Fellow at the Iowa Writers' Workshop. Her poems have been widely published in New Zealand, including in Sport, Landfall and Best New Zealand Poems. In the last five years she has lived in Wellington, Beijing, Shanghai, New York, Dunedin, Wellington again and currently Auckland, where she works as a corporate strategist.